8. Cart with quick release wheels/ cart Push/Pull handle. - 802.11ac/802.11a/b/g/n, Bluetooth (v4.0), 8MP autofocus rear camera & 5 MP front camera, Windows 10 Pro (64-bit), MIL-STD-810G drop-tested impact resistant non-slip composite material. 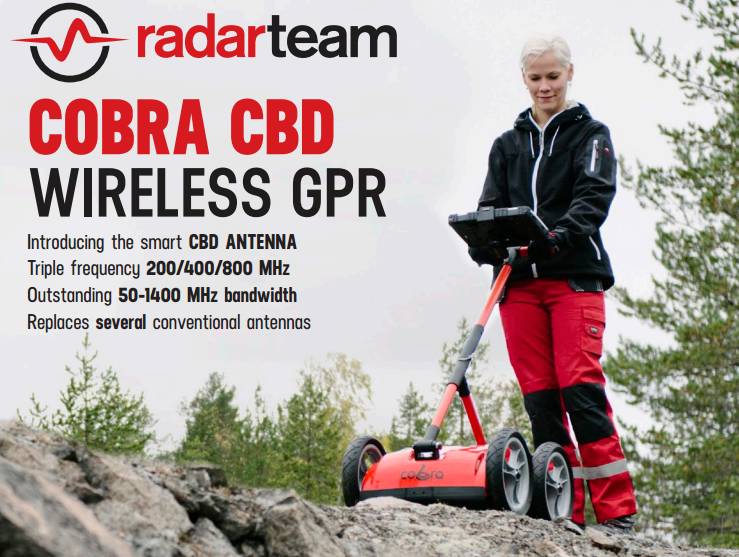 The COBRA CBD WIRELESS GPR collects data from hundred thousands of pulse reflections each second to help researchers identify objects below ground. 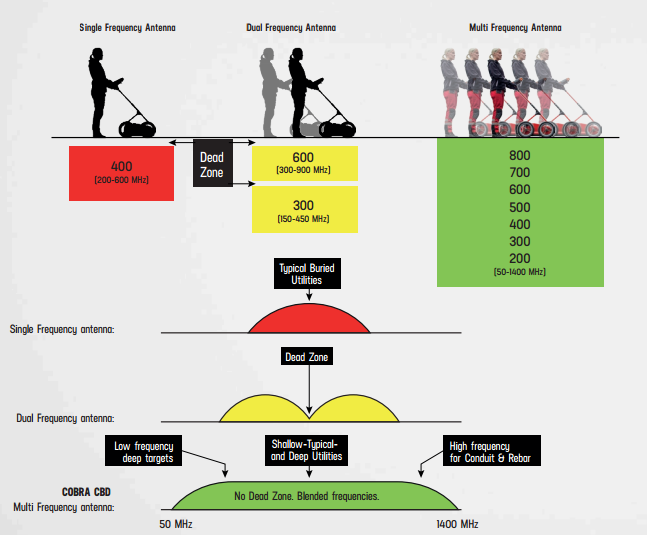 It works in a multi frequency band from 50 to 1400 MHz, thus replacing several antennas with different frequencies used by other and older GPR systems. The unique CBD antenna transmits pulses with triple frequencies in a blended pulse form. The CBD antenna selects the optimal frequency needed for all layers and targets at different depths. The CBD antenna data received can then be used for accurate velocity/RDP values for layers and targets via frequency analysis (using a proprietary formula - with linear relation between reflected frequency and velocity). A 3-D software translates several 2-D radar profiles into a 3-D map, depth slice, at different depths. For full 3-D, the spacing between 2-D survey lines must be very close ( λ/4). The depth slice below shows a buried Roman building wall remains, at Carnuntum, Austria. Locate gemstones pockets or find kimberlite, lateritic nickel, as well as cracks in bedrock and building stones. Map internal structures and voids in soil. Inspect internal structures and identify voids, such as roads, bridges, tunnels, railways and drains, and locate different types of material such as plastic, concrete, clay and metal pipes. Map concrete before drilling, cutting or coring. Detect obstacles in front of directional drilling operations. Locate tunnels, bunkers, hidden weapons and drugs. Find land mines and unexploded ordnance (UXO). Through wall imaging. Locate hazardous waste, UST-location. Delineation of contaminant plumes and product spills. Map shallow lakes and rivers. Complete airborne mapping of snow and ice thickness, which allows for the findings of buried items. Find crevasses and avalanche victims. Profile ice roads in detail. Glaciology research. Locate agricultural and golf-green drainage tiles. Determine soil water content and conductivity. Map tree roots and rot in wood. • Mixed/blended data with automatic optimum frequency selected through all depths in one single file. • Near surface data with high resolution/frequency and deep targets with lower required frequencies. • No need to set frequency filters. The smart CBD antenna filters by itself. • No ”dead zones” or blind spots in data due to blended frequencies. • Calculate velocity directly from frequency content with proprietary formula. data acquisition. DAQ-software for control, display, processing and storage of GPR-data. Push and Pull non-metallic handle and support, tactical RAM-mount, crade for recommended and purchased rugged PDA/PC. 12" quick release non-inflatable wheels. High resolution SW-encoder. Operating depth: 0-2000 ns selectable. Typical 0-500 ns. Depth Range: 0 - 10 m depending on ground properties. 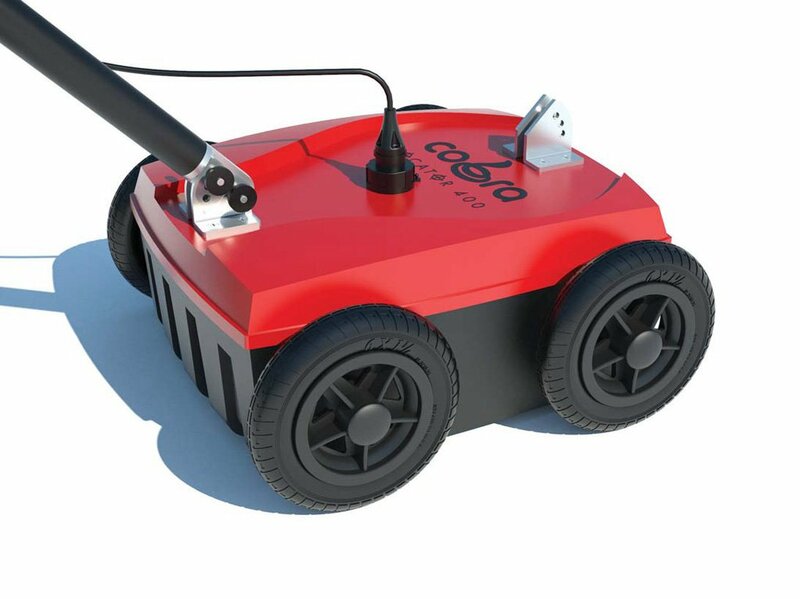 Software: GPR Data Aquisition software included (COBRA DAQ) for Cobra Wireless GPR and Cobra Plug-In GPR. PRISM Post processing software with 3d export module (Voxler, Reflex 3d, GPRSlice).